for a first purchase i recommend grado sr80 or if you have more money beyer dt880 or k701/2. buying $30 headphones is just a let down. unless you just have no funds. i understand. i just wanted to state this because if i was told all i can do is keep one headphone that is under $300 it would be one of those. i could argue the k701 is more accurate than the he90. of course accuracy is just one small part of the whole equation so that is really neither here nor there. i do think the k701 could be someones first and last headphone so long as they do not join head-fi. I think a better option would either be the Xonar ST or STX. Albeit many who've done reviews on the ST vs STX lean towards the ST as providing the better sound. Except ST is PCI and STX is PCIe, so either you need a PCI bus or a PCIe to PCI converter. Although I haven't run into anyone using a converter may or may not work. Both are able to drive headphone upward to 600ohms. And from what many have mentioned unless your willing to spend some good dough on external equipment the best bang for buck you'll get is the ST. Considering it uses some of the top parts on the market at a reasonable price point. I mean sure external equipment would be great and all but again money, time, and research are going to be needed. somehow i just know i will get the new stax flagship. i wish i could quit this addiction. it is stupid quite frankly because my loudspeaker system can best any headphones. period. You have something that could best the Stax TOTL's? What the heck do you have? Those Stax reportedly sound like $100k stereo systems. My best speakers are KEF Reference 203's I scored on local classifieds. They weren't cheap but were a bargain compared to retail. The Grados are okay, but I heard quality wise they weren't too great and break easy. Plus, I'm not a fan of on-ear, I much prefer circumaural. Grado SR80i, buy bowl pads with it. trust me, it helps. Buy the headroom bithead. It will work as a usb sound card, plus a high end amp and pairs perfectly with the SR80i with bowls. It's a really good combination and I heard a lot of synergy. Also grados don't break often, they're just really really simple. That's the amp I strongly suggest you buy if you get grados. There are the grado line. Protip: the cheapest headphones aren't the worst. The iGrado is actually the same exact drivers of the SR60i, just that the wear style is different. I personally think the SR80i sound better enough to justify the price. All together it'll cost you about 270$. I'd strongly suggest looking for a discount. I have this combo, I have personal experience with it. I'd sell you my bithead but it's my girlfriends main "hifi". I like that amp a lot...I love that it's batt powered, it should keep my macbook pro batt alive a while longer. The problem I have with the Grado's is the 'on-the-ear' config. I can't stand on-the-ear 'cans,' I was ready to buy some beats solo a year ago, and tried them on, hated them after about 15 minutes of listening to music. I'm assuming there's some comfortable models out there, but I think I'd prefer circumaural headphones, especially considering I'd use them a lot traveling, and don't want to disturb others. Found a pair of AKG K172HD for $149, seems that they retail at places like Best Buy and Amazon for much more than that. Are they better than the AKG271MKII?? I like the Grados, but if you are looking for comfort and especially off-the-ears comfort they are not it. MP3 files are lossy-compressed. You can't get the data that has been removed back, so converting them to another format will only make them sound the same or worse. MP3s are not necessarily bad; depends on how heavily compressed they are, and the music itself. I'd listen to what you have and see how it sounds. I've been amazed at the difference a USB DAC makes even listening to 192k streams on Pandora (I bought the 1 year PandoraOne membership) and I'm just using a FIIO E7 I got for $75 shipped. Because of this, I can't imagine buying a headphone amp that doesn't have USB DAC functionality + portability if you're mobile. Once you have that, then I'd consider a stationary headphone amp. Thankfully it's a hot marketplace for headamps so there are many to choose from and the prices are coming down on many. I believe that the comfort level of Grados is sufficient with the plastic variety. The SR80i I suggested is so light on your ears that if you complain about discomfort you're a sissy. The bowls hurt only on the heavier Grados, the wooden and worse yet the aluminum (like my SR325i) are VERY uncomfortable with the bowls. For my 325is I use the Sennheiser HD414 pads, which offer a warmer sound and a greater level of comfort. Also, Grados have a interesting headband design. The headband is actually a thin metal strip, but a sturdy one. This means you can pretty much custom tailor the fit of your grado headphones to your head by bending it; eg I have a bit of a cone head, so I bend two divits on the left and right of the center and this gives me a tight by very comfortable and reassuring fit. Now, the SR80i doesn't have the leather sheathe but this is easily fixable if you find that you want it, jmoney leather hand bands tend to be affordable. Remember how I said I use the Sennhiser HD414 pads? Well there is a MYRIAD of pads available for grado headphones and they're all compatible. S (comfy), M (bowl), G (bagel), HD414 (sennheiser pad, about 5$ a set), etc. And there are more options for people who want to go deeper. Basically, if I had to say so, the single most customizable headphone on the market are any given grado product. Some cans respond better to some pads, and I wouldn't reccomend bagel pads on the SR80i for example, but bowls, any day of the week. The Bit-head I recommended offers all of this functionality. The batteries are the compromise here, unfortunately in that they are not recharged by the device. They use standard consumable batteries. You have easy access to them so it's pretty easy to swap batteries out. Whether or not the performance is acceptable with any type of recharge-able battery I don't know, never tried. Rechargeable batteries offer less current than non rechargeable, thus the compromise. Rechargeable batteries offer less current than non rechargeable, thus the compromise. That's what I had read, that using rechargeable batteries lowers the quality of music. Do you know of a USB amp (or is USB DAC the proper term?) that recharges when plugged in? I'd like this for the simple reason that I wouldn't have to buy tons of batteries (the one you linked me last 20hrs on 4 AA's). Then again, I'm really looking to just use this on my desktop for the time being, and when I study abroad in China I'm sure I'll be able to find plenty of AA's cheap. I have all of the Grado pads, the yellow Sennheiser pads, and an extra set of bowls that are taped. The only ones that I'd say are comfortable are the Senn pads and the G-Cush (circumaural) pads, but the G-Cush IMO does not sound good on the SR80i or SR225i; highs too present, lows non-present. My favorites are the bowls (taped or non-) or the flats. I can wear them and I don't complain about it, but they're not especially comfortable. There is a midpoint between comfortable and painful and that is where the Grados sit for me. My ears are harder than average, so that probably doesn't help. Adjusting the headband does help a bit. The Denon D2000 I picked up last month, now that is comfortable! How is this as compared to the bithead?? Seems a lot of people like this. Looking at reviews, it seems the ATH-M50S is still my best bet. I'm 90% sure I'm sticking with that. Need to read a few more reviews to cement my decision. I wish I could offer an opinion myself. I actually don't care for the sound of denon's, but I may have to try them again. The bithead has the option of simply powering it from USB, and for low impedance headphones this is sufficient. For high impedance headphones, you'll most likely prefer something of more testicular fortitude. For grados, it's wonderful. If the fiio e5 is any indication of the E7's performance, I probably would strongly dislike it. They in my opinion don't really offer anything past a volume control for line out from an iPod, whether this is true for the E7, I cannot say. If a $150 Ducky keyboard costs '10 tons of bamboo,' how many tons do these cost?? 40 tons? ...that's a lot of bamboo for you to part with. I am the chairman of a bamboo production and harvesting conglomerate. The best part of it is being called the chairman. DO YOU FEEL THE BEAT? I DO. One Keyboard to DOOM them all, REALFORCE. This is what I was thinking. The E5 is probably a strong indicator of the quality of the E7, and seeing as the E5 isn't very good I doubt the E7 is. The bithead seems like the better bet. Especially seeing as it can be powered by USB, which is what I was really hoping. The batteries would be good if I can get it hooked up to my ipod, though I'm a) thinking of selling it and b) not really looking forward to carrying the bithead strapped to the ipod. The Denon D1100 seem like a good deal, but from what I've read the ATH-M50S outperform them, thought not by much. I'm not an audio expert so I doubt I'd be able to spot the different though. I think it comes down to looks at that point, and the ATH-M50S look better than the competition. In that case, Chairman Panda, I hope we can become steadfast friends, as I am somewhat lacking in bamboo at the moment. The E5 is probably a strong indicator of the quality of the E7, and seeing as the E5 isn't very good I doubt the E7 is. Measurements look pretty unconspicuous though, with a ruler-flat frequency response and pretty well-behaved distortion spectrum even into a rather heavy load. I'd say the E7 can drive most any ordinary cans, though it may run out of output volume with modestly sensitive 600 ohm samples (maximum output is about 2.2 Vrms, so you wouldn't get more than 97 dB SPL out of a K240M/DF). As a price compromise between the two, I found a NuForce Icon uDac that seems to be pretty popular. It's a smaller unit than the other two we've mentioned, but apparently it's a big performer. I don't think it can be used with mobile devices, though, but at the price point of headphones I'm looking at I doubt any of them are powerful enough to warrant buying an amp for my ipod touch I'd rather just get a USB one for my laptop/pc. The 80 hours of battery life and lithium-ion battery on the E7 still has me interested, even if the quality is ~E5 standards (which, as you pointed out, is probably not the case). Again, I don't have a trained ear for great amps so I don't know if I'd really be able to tell an okay amp from a good amp. It suffers less EMF than the bithead, which seems to be pretty prone to it, and is small enough to sit on my laptop and take with my ipod if i feel like carrying it around. The NuForce on the other hand looks like a solid piece of equipment that will do well with both my laptop and desktop, that doesn't suffer much from EMF. So I guess it's a toss up between these two. Anyone have a quarter...? Maybe XL, you should instead get a cheap penguin/altoids cmoy headphone amp and grab a grado. Much cheaper and those cmoys often have rechargable batteries. I am seeing the nuforce at 250$. The bithead is 150$, and the E7 is 100$. Not sure how they're landing inbetween? Oooooh, the udac. Dur. I have no experience with it, to be honest. I can't find much about them online. Do you have personal experience with them? A CMOY is like the lightsaber of every young audiophile jedi's path. It's usually your first amp, self built or not. Though you get way more props for building it yourself. But at that price there's no benefit to be honest. Just buy you a penguin and get a good set of cans. That does leave you without a dac but there are plenty of cheap dacs around. Honestly though, if you're going cmoy, I'd go RA-1 clone instead. Granted it's not really nice, but it's an amp designed to run with grados, but similar in topology to a CMOY. Also it's cheaper at about 2$ less since shipping is free. Couple it with the aforementioned dac and I'll wager you'll get top end performance from low impedance cans, especially grados which it was voiced for. So, I've been following this thread for a few days and am curious about something... How can I be certain that I would hear a difference if I did upgrade some of my equipment. Mind you, I definitely don't have the money to investigate at present, but it's a niggling question of mine. Understand that I work in the warehouse of a steel distributor. Before that I worked in a junkyard, preceded by a rock radio station and a racetrack. That is, it's very likely that my hearing is somewhat damaged. The small amount of research that I've been able to do, this week, tells me that the source matters a great deal, regardless of the outlet. I'm guessing that would require me to upgrade my on-board audio or buy some kind of DAC before an upgrade in headphones or speakers would be noticeable -- currently I'm running a set of Logitech X-530 speakers or a $30 Logitech gaming headset, as the mic is a necessity -- and spending ~$200 with that knowledge seems like an all-stop in my situation. Given too that most of my listening comes from gaming and podcasts, is it worth considering? Um its not a product that is made by a "brand".. its more of a do it your self thing but there are premade ones by hobbiest. It wad developed by Chu Moy and shared to the headphone people. I love the Denon D2000's enough that I will be watching for some D7000's. As for the FIIO E7, you can get it here for $75 SHIPPED if you offer. It charges via usb and has a lithium ion battery. My only complaint is the jack quality but I would buy again. Great intro head amp. If the bithead takes AA's, spring for some Eneloops from Amazon and a good intelligent charger. They cost but are great batteries with long shelf life and will save you in the long run. The Fubar IV looks great, as do many others out there. He declined an offer of $70 shipped before accepting $75. You could try local pickup but most volume ebayers don't like local pickup. Honestly $75 is an unbelievable deal for this amp. It's cheaper than China sources. I am from the mainland so i must support my mainland brothers in arms, audio-gd. My next purchase will be a audio-gd NFB-10ES fully balanced dac and full balanced amp. Panda's aren't known for their balance as they seem to have issues falling out of trees however this is the year 2011 and I'm going to change all that. How can I be certain that I would hear a difference if I did upgrade some of my equipment. The small amount of research that I've been able to do, this week, tells me that the source matters a great deal, regardless of the outlet. Given too that most of my listening comes from gaming and podcasts, is it worth considering? Headphones are important, source is even more important, the amp is well.. just get an amp that's strong enough to drive your cans. A lot of wankery is happening in the audiophile world. With more expensive headphones, you see diminishing returns. My old, ****ty headphones were almost as good as my expensive new Beyerdynamic DT 880 Pro's. Less detail and less bass, that's it. Games and podcasts are usually already lossy compressed. Not that this means a lot, I've yet to be able to separate (decent) lossy and lossless in a blind listening test. But if you're not a dedicated music-head, then I wouldn't go crazy on headphones. There are good ones even in a modest price range. For example the Koss Porta Pro. They look like a horrible 80's remnant, but they have awesome sound for that price and a lifetime warranty. You don't need an amp for them, either. These guys are a bit more level-headed than the head-fi forum IMO. I trust this man...if only from his name. I guess I'll get the CMoy amp linked above for now, as well as the ATH-M50S. If I need a better one I can buy it. The ATH-M50S should work fine through my PC and laptop even without the amp, too. That's a good path to follow. I wouldn't start by upgrading, I'd start by diversifying. Buy what you want now, but then branch out. Also, seriously consider the RA-1 clone. It's similarly cheap and would more than likely actually sound better. The only thing that kills me about this is I want the USB DAC for the random times I'll pop on CS, or to run my speakers through when I feel like laying down and blasting music over speakers. The CMOY won't have that. I guess it's E7/bithead/nuforce or bust then. On another note, I've decided on the Audio Technica M50S. My girlfriend's brother is a musician and recommended them over similar pricepoint Sennheisers, Denons, and AKGs. He did say, though, if I wanted to pick up a great pair of headphones and not worry too much about money the AKG 701s are a good idea. But yeah...money and all that jazz. Be sure to let us know what you think. Thank you, GM. Your post was quite helpful. The only other issue that I can see is that my need for a mic apparently cuts the potential pool by a massive percentage. While I noticed that there are a solid number of in-ear headphones that are iPhone compatible (and therefore have a mic), I'm going to assume that the mic is of the kind that one has to hold to their mouth when speaking. That's no joy for gaming over Ventrilo. Certainly the various gaming peripheral companies (e.g. Razer and Steelseries) have "gaming" headsets; I tend to think they're a lot of money for a lot of flash, though. I fell into that trap a few years ago when I bought my Death Adder, a Tarantula keyboard, a pair of Razer Barracuda headphones. The Death Adder I swear by. The other two were fragile, ill-functioning wastes. Razer mice withstanding, I probably won't touch another "gaming" product unless the cries of its greatness penetrate the heavens. Man, this audio business is far more complicated than my foray into mechanical keyboards. 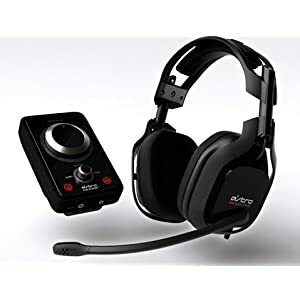 You can always get a great pair of headphones for music listening, and strap one of these to them when you plan on gaming. That's what I'm going for. I'm not really worried about having the best quality mic, and I speak pretty loudly anyway, so it seems like the best of both worlds really. And it's really cheap! Funny, that's just the mic I bought too. Headsets usually sound bad. The only downside with the Zalman is that it won't fit on the thin (typical for cheap) headphone cables. Fits fine on most "reccomended" headphones for gaming, however. ATH-AD700, MDR-V6, Grado SR80i, HD555, etc. Almost everything I've ever used for gaming it works well with. But hey, we're not really the sort to buy "cheap" stuff, are we? It's what I use when I can find the darned thing. I just recently picked up the Astro a40 system. Although they seem to have mixed reviews, they are great so far for my needs. I bought them mostly for gaming, but will use them for a lot of movies too. I like how they're compatible with just about anything, and extremely comfortable (which means a lot to me). I'm running Gran Turismo 5 B-spec right now in fact. i have some ultra high end phones and a exceptionally high end loud speaker system. let's just leave it at that. i do not really want to get into the specifics. i guess it would be a toss up between the he90 and the speakers. either is more than good enough. the funny thing is have had nimwit's a/b with bose and they exclaimed "they both sound like headphones". lol. it is like a cigar or irish single malt whiskey. you have to have the ability to realise the difference. Nice thread here! as I just tossed my shabby Stelseries headphones out of my window, I am now in desperate need of another pair of good headphones. - I'm planning to use them on my PC （which has an external USB sound card connected to it) and mainly just for listening to all kinds of music, I don't care about gaming. that's about it, my budget is $500, what headphones am I looking at? that AKG looks great, shape/size look perfect, is AKG a reputable brand? I've heard of them but not familiar with the brand at all. now come to think of it, are wireless headphones any good? As long as they aren't too heavy I think I could use some less cords on my dekstop. In my internet travels I have heard high praise of AKG. I think they're definitely a safe bet. I wouldn't go with wireless...I doubt the sound quality would be as good. And no one say ya had to keep the headphones always plugged in...the AKG come with a really cool stand you can display them on next to your pc. Ya the last time I had a wireless headphone was a while ago and it was awfully heavy with horrid battery life, guess the sound quality isn't as good either? does that AKG 701 have an open ear design? Page created in 0.137 seconds with 72 queries.